The printed pattern usually ships within 3 days. Now Available in Misses (XXS - XL) and Plus Sizes (XXL - 5X)! Ruched-T Pattern #AW1123 offers so many design options! 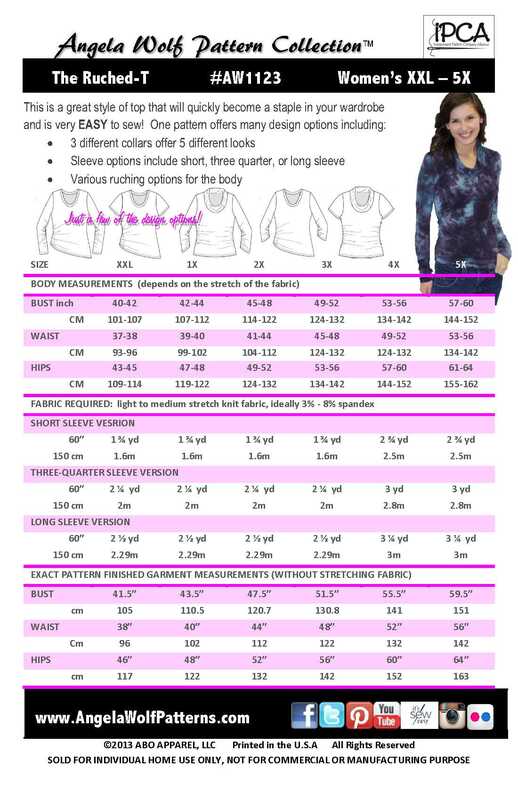 Three different collars and various ruching options or take away all the ruching for the perfect fitting t-shirt. 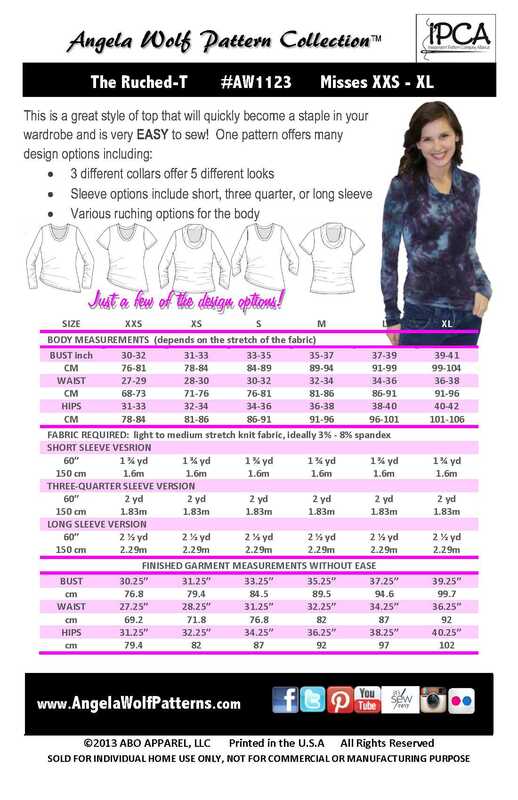 Fabric: This pattern is designed for medium stretch fabric, 3% - 8% spandex. The ruched-T was a great sew. I will be making more of this pattern. Love this pattern! Instructions were clear. Tips were helpful. Fit is great. This will be a go to pattern for me. Thanks for signing the pattern. This is my first experience with your patterns and I was so pleased. Not only with quality of instructions but also with size and style. Thank you. Love the simple way this goes together. Absolutely outstanding for beginner or experienced sewer. I was able to use the patterns multiple times. The explanations are nice and clear. I find the price little expensive. The pattern is also trendy. I don't like old ladies cloths. Purchased this after taking Angela's class, Serging Beyond The Basics, and another student inquired about the shirt Angela was wearing. I too loved her shirt so I went to the Web site and purchased. So far I have made two and have the fabric for a third. The directions were easy th follow. I just love how they came out. Size was spot on, unlike the catalog patterns I am accustomed to. Well worth the price. I sewed the pattern in 3 different knit fabrics and each product looks entirely different. I easily altered the pattern to add long ruched cuffs--taking out the rushing going down the sides of the arms. I also added a ruched band to the bottom of one as I didn't like the way the fabric rolled to the front--fabric problem not pattern problem. I added stay tape to the shoulders for stability--was surprised the feature was not recommended in the instructions. Loved the pattern so much that I bought another pattern--the fringed skirt. This was so easy and a great fit! I can tell this will be a favorite pattern for me. Can't wait to make more of these! The pattern was true to the size I would buy in the store. The instructions are very well illustrated and explained. Perfect T for a 73 year old! The sizing was very good. I did a trial shirt and won't have to change a thing. I like the format of the directions. I needed a reminder to always read the entire directions before starting a project!